This is long overdue! I promised quite some time ago that I would share how and where I store my dies. I have different types of dies, but right now the ones I use most are the thin metal dies. I’ve tried a number of storage situations but knowing myself, I work best when things are within an arms reach and if they are organized and labelled. I found a large Media Rack and installed (secured to the wall) on the left side of my crafting desk behind my computer. I love this because it takes no desk space! 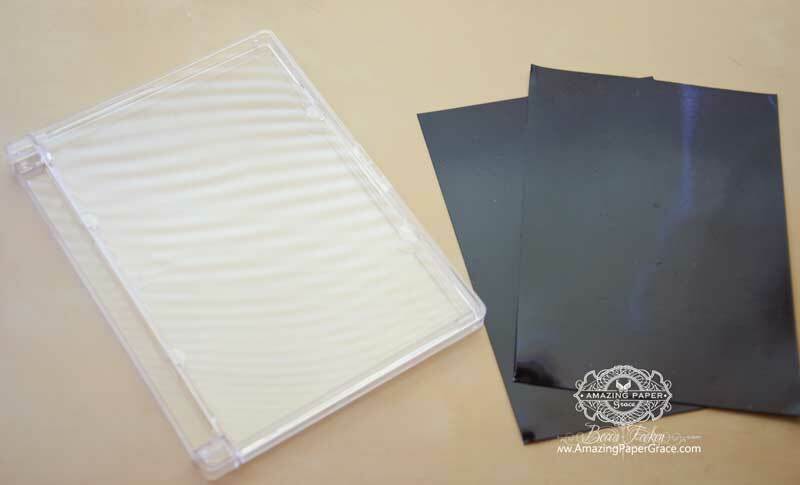 I store large die sets in Clear DVD Cases and small sets in Clear CD Cases with magnetic sheets on one or both sides.. Extra large dies are stored in a binder (see my thoughts on that below). I have several groupings – these make sense to my workflow and might not make work with your workflow but it helps me locate what I need: My groups are Labels, Shapes, Card Creator, Accents and Motifs, Flowers, Borders, Expandables, D’Lites, In’Spires, Cut-Tuck-Fold and several other smaller subsets. The colors on my labels have to do with the year the die was released because I try to use new dies along with old dies and it helps me locate them quickly. Look around, there are tons of great ways to store dies, it just happens that this is the best way for me. I found that binders were too heavy for me to lift (I still store my Grand Dies in binders for the few occasions that I use them). I also found that if my thin dies were not contained, that they were lost too easily. Lastly, I found I could not keep them in original package because when it comes down to getting them out, they were not getting used. I’ve been a longtime customer of TapeOnline which is where I get all my DVD and CD cases. They have graciously offered a package for giveaway! On the website on each product link above they have a thorough description of the product and there are tons of customer reviews. Check it out! In order to win, leave a comment on this post before Tuesday, May 20th at noon CST. You are allowed to leave one comment per day. The name will be be picked by comment number through random.org and I’ll post the name of the winner on Tuesday May 20th (please check back) and the winner has to claim their prize with 48 hours by responding with their address through my contact tab at the top right hand of the blog. I’ll forward the address on to TapeOnline for shipping directly to the winner. The clear cases are offer offered only for domestic US Shipping because for international guests, the shipping exceeds the cost of the cases HOWEVER, if you are one of my sweet international guests, I’ll offer an alternate prize of stamps and paper that I’ll take care of shipping (see, I love you too)!! Here’s what the DVD Cases look like. Thanks for letting me share my storage, many of you have asked. Be sure to visit every day until Tuesday to increase your chances of winning. Have a wonderful weekend friends! If you have any questions about this die storage, feel free to leave your question in your comments and I’ll continue to edit this post to include the answers. 2. Pam Roth, comment #77 asked where I get the heavy duty cases. All the links are above – simply click on Clear DVD Case or Clear CD Case. Also, I wanted to make sure you know they are not heavy duty. They are just like every day acrylic cases that you use for movie and computer CD/DVD’s because that’s what they are. Mine have stayed in good shape because of the way they are stored here. Every now and again I have to replace the small CD cases which have more fragile tabs but I have yet to have to replace a DVD case. Mine have always arrived from Fedex intact, but if the mailman had a bad day and thew the box down, they may break. 3. Dottie Davis, comment #79 asked how to store extra die cuts. Glad you asked Dottie . . . when I get a new die, I cut it right away. I do that so that I can see how it cuts and want to make sure it cuts perfectly. For the first six months, I keep those extra die cuts in the case. That way when I pull it down I have a sample right there. After six months I have no doubt used the die several times and those extra cuts go in my die cut drawer. I can’t tell you how often something from that drawer goes onto a new card – it was just in the right place at the right time!! Never throw those away, they come in handy in for card planning!! 4. Barb Parker, comment #86 asked how I reach stuff at the top. I’m blessed to be almost 6 feet tall :-) But I do have a step stool in my craft room. It’s a fairly small room and to make the room work, I’ve gone vertical! 5. Sarah, comment #142 asked if the full sheet or half sheet magnet was needed for a DVD case. Depends on what your full sheet is Sarah. If your full sheet is the one purchased at tapeonline, it is sized 4.75″ x 7″ which fits the full inside of one half of a DVD case. You could cut it in half if you only wanted half of one side of the dvd case filled. I use full 4.75″ x 7″ sheets. 6. Jean C, comment #244 and Mary Kimes, comment #263 asked about the baskets that hang over my media shelving holding dies. They were purchased at IKEA. 7. Beth Ellis, comment #268 asked what program I used to make my spine labels. I used Excel and dropped the names into a regular spreadsheet grid and colored the columns. I did this because the ACE Sheets are a recent addition at Tapeonline. I used a whole page sticker sheet but will be very honest, my labels don’t stick well and I have to continually reinforce them with a dot of glue. 8. Margie Luttrell, comment #322 asked how do I remember which set I want when creating. For each type of die I keep a current catalog – either on my computer or printed (I prefer printed) and I flip through the catalog to look at shapes instead of hunting through the dies themselves. Also I go to my extra die cuts drawer when I’m not quite sure what I want…. 9. Linda R, comment #374 asked about the catalog I use . . . great question Linda! So the answer is why reinvent the wheel? I simply download the latest Spellbinders Catalog. It says in a drawer to the left of the desk you see in the picture. Inside that catalog I mark what I have, what’s retired and what I’d like to get :-) I have the same system with my Accucut and Sizzix dies – I keep both current and past catalogs in my handy dandy catalog drawer. 10. Ann Robbins, comment #377 asked if I buy my dies. There’s really no set simple answer to this . . . in fact, this so made me smile. I liken it to the Christmas that I thought I would work in a yarn shop to make money for Christmas. I already hear your laughter!! I made not a cent of extra money for Christmas but there’s sure a lot of yarn at my house and in the end everyone was happy. OMG…Becca…I absolutely love your storage system…my dies are all over the place…and to keep them in one area that I can see and know that I would use is totally Fabulous…the Giveaway is the cherry on top…thanks so much for sharing. I just love your storage system Becca , thanks for sharing . You sure are well organized and what a wonderful workplace. I am Super Amaized with your talent!!! Right now I am having a twenty-one gathering and everyone here is in awe of your creations!!! There are many ooo’s & awe’s here!!! I’ve had a similar storage idea for many of my clear stamps…but have yet to find a satisfactory one for my dies as they need to be portable for classes etc. not just in my studio. Thanks for sharing and for the opportunity. Many thanks for the give away. I am still exploring ways to store my dies. Yay!! Another chance to win these great cases. I love them, esp for the long Spellbinders that won’t fit in the ‘normal’ size CD case. Becca my mouth dropped when I saw your storage system. Just brilliant and something I have to do.. thank you for showing us and giving us the chance to win one of your great cases. You are an inspiration to a lot of us. I still have to organize my dies but have been procrastinating. This would be a great “kick-start” for me! Wow, how nicely organized your craft space is! I’d love to try these out. Wow, wow, wow and wow!!! I so need to organize my dies. This system sounds so simple and I adore your space. Love the organization I use the DVD and CD cases as well but usually use old ones that the CD has been stored by other means so new cases would be great. Thank you, Becca, for showing your die storage. You could not have posted for me at a better time: my craft room is so small and I have numerous dies. I am finally moving my craft room to a larger room and I am trying to figure out how to store my dies. I wrote Spellbinders asking if I could buy empties of their new packages (which I love!) but they were unable to do so. Since their response I have been searching the web looking for the best solution. This may work! It makes my heart happy to see the lovely work space you have created and work in! It shows how much thought and care you take in what you do. Becca you always have such great ideas for cards and decorations, The same can be said for your ideas for storage and organization. I have been following you on email for about 3 years now. You are amazing. I just ordered my first thin metal dies a few days ago. Can’t wait for them to arrive. I so appreciate the experience-based tips that you have shared. I will benefit from your knowledge as I begin to develop my own organizational plan for storing my new goodies. OMG!! I LOVE the brief look we had of your craft/scrap area!! It is AMAZING!! I would LOVE to win this set of DVD cases and give this way of organizing my dies a try!! WOW! This is a fabulous idea, and I will be trying it. I have dies, here, there and everywhere – in plastic cases, in magnetic boxes, on magnet sheets on the wall. All of them tedious. Thank you for sharing your die storage! I would love to have a system like this! 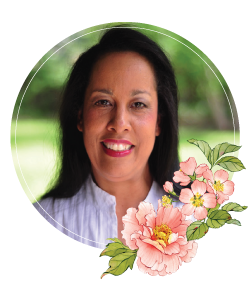 Becca…As always your “imBeccable” style shines through–this Giveaway could not happen at a better time–my dies have outgrown the popular art box with magnetic sheets and I am always annoyed by having to take the ALL out to see where the die I am looking for IS! Staples never sells anything like this–believe me I have researched this challenge about 19 times. wow… your room looks so neat and tidy! Beautiful way to organize the dies! Very handy and accessible! Oh my! This is an amazing die storage option–you have done a wonderful job of making sure your dies are accessible and well-labeled! I love this! Wow Becca, Your area is so neat. Mine is always a mess. What a great way to store your dies. I have been trying to come up with a system. Becca please share more of your craft room with us!!! I am about to have a whole new room to myself and this sounds like a perfect idea. Thanks for the chance to win. I skipped reading all the other comments so I could say “you could be my twin” (organization queen) ! I love it!!! Like you, if I have to look for it, it interrupts my creative thought process. I will not use it if it’s an inconvenience to get to it. My crafting friend says I’m obsessed with being organized and I’m sending her your email, so she can see your craft room! I think it’s beyond wonderful! I currently have my dies stored in binders (got the idea from a crafter I met at a crop) and you’re right; they are heavy after you get so many of them. Going to try something else because I don’t have room enough for a media center because I have too much paper. Becca, this is impressive! Being able to quickly put my hands on what I want to use at any given moment is only a dream for me at this point in time. I would LOVE to get to this! WOW Becca…you are SOOOOOO organized – what wonderful storage! Thanks for the chance to win and get started on my storage! I love your organization! It is truly Inspiring no wonder you can make such beautiful cards! i too store my dies in DVD cases along with magnetic sheets, so much easier than in a folder, and the folders become heavy. Though I have no where near as many as you lol! Okay let´s hope I manage to finish this time, before the site decide to update here again and it all disappear once more LOL. Goodness such a neat area looks so impressive too! GREAT storage, but unfortunately I haven’t got the wall space. I store my dies on magnetic sheets which are stuck to original packaging showing a picture of the dies. The wallets re 5×9 in. and contain 12 pockets. I number each folder and label the dies with the folder no. they’re stored in. Any dies too big for the folders are stored on a “clip-it-up” carousel floor stand (by SimplyRenee). I also transfer the visual image of a die/set as I order and store it by adding it to a computer folder called “visual dies”. Once received and stored, I store the location ref. in the catalogue. In this way I can browse through my catalogue to see which dies I want to use. I also catalogue all my stamps/embossing folders and masks which are mostly stored on my floor stand in their packaging. Again, the packaging has a label containing the location, as does the image in the “catalogue”. My catalogues are computer folders named “visual stamps, visual embossing folders etc”. I find this system serves me well. Wow another chance to win! I want to win these they would be great for my growing stash of die’s. I have tried a couple different methods but none worked well so. This looks like it would work so if its free, I am willing to try this one and see what happens. Love your cards and boxes. He is always trying to improve my room as he says it tires him looking at it. Hello!! I have been following you for quite some time on your blog. You have such a niche’ for creating beautiful cards. Have you ever tried your hands at scrapbooking? Wish I was as organized as you are Becca! Intend on working on my craft organization everyday even if it’s only 15 minutes – it all adds up. Hi Becca, Wow !! Wow !! Wow !! I’m loving your organisation, your idea is brilliant !! I keep my dies in their packages in plastic boxes that have hanging files inside, and I stack the boxes on top of each other, but they get so heavy to keep lifting down, the one I want is always the bottom one haha !! You are so good to us ‘international’ guests, thank you. Becca…showed your storage system to all my stampin’ and srappin’ friends…everyone loved it…Best Buy is going to be swamped with orders for this CD Rack…thanks for the Fabulous Give-A-Way. Fantastic system! I have a ton of dies as I also love them and have been looking for a better way to store. Thanks for the chance to win. Easy to find products makes for more creativity! It took less time to organize than it took to hunt, dig, get upset when trying to find something. It was less expensive to organize than to keep buying duplicates. Thank you so much for showing & telling us all about your CD/DVD storage solution for your dies, it’s such an excellent idea.I shall try this as well if I cab but them here on Madeira. You are such a giving person Becca. Thanks to TapeOnline my dies are organized and protected. My original system required more space than I have. Then I discovered the cases and magnetic sheets from TapeOnline. WOW! What a difference they have made! Love the product. Thanks, Becca , for sharing your labeling system. I’m still working on mine and you have given me some good ideas. WOWZA!! What an awesome storage system. I’ve tried soooo many ways to store my dies and haven’t liked any of them. I think you have come up with the perfect solution. I’ve converted all my rubber stamps to cling mount with EZ mount sheets and have them stored in CD cases and never in a million years did I think to store my dies in CD cases and didn’t even know there were clear DVD cases available until now. I just gotta add my name to the giveaway, but more importantly, say that you are awesome! Not only a lovely lady, but one of the most creative and artistic people I know of. You make paper look like lace, turn cardstock into museum quality works of art, and inspire me with each post. Thank you for the time and effort you put into these posts and for sharing them with us. 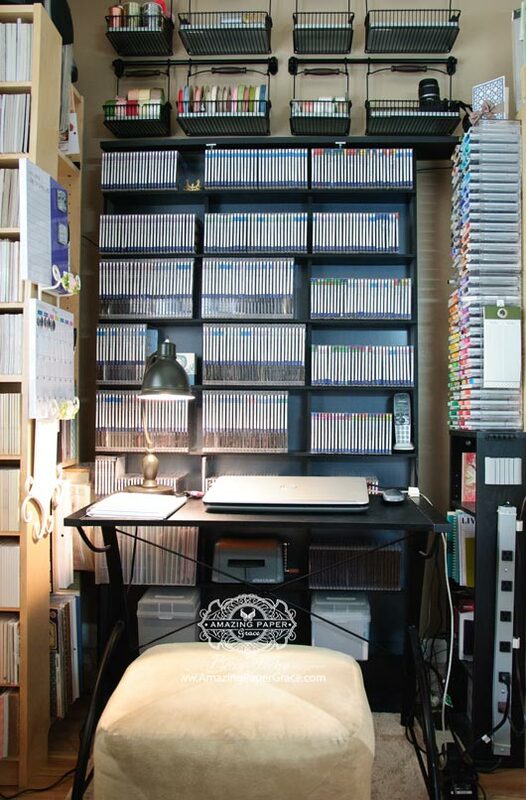 Your work space pics are a treat, and I appreciate the opportunity to get to see how you store your die-cuts. Great job! If this isn’t the perfect space! Swoon I hope to do that when I grow up lol! Your organization so neat and tidy. Such a great place to spend with. I have well over 100 sets of dies and since the Art Bin box for dies with magnetic sheets came out I have bought 4 and most are filled. I use one for shapes, one for flowers and butterflies, one for borders and one for CHristmas. When I buy new dies, I cut off the label and staple it to the back of the magnetic sheet. That way if I don’t \put the die back in as soon as I use it, I still know which mat it goes on. On the outside of the box, I have a typed list of everything that is in the box by the S number and name of die. It is working quite well for me. Becca, I always look forward to your new blog and wish you did one everyday!! love, love your system!! Where did you find the media shelves? I have so many dies and I am looking for a better way to store them. thanks for the ideas and the chance to win!! I did check out the cd case, but the s/h is rather high. Becca, your additional comments are answering a lot of my questions…thank you so much. I have an extensive collection of dies – my thing too – and am searching for a better way to store them. I have an Excel spread sheet on my phone, i-Pad, and computer so I can tell when shopping what I have. However, it does not allow me to SEE what I have without going thru my two zippered 3″ binders sorted with an A-Z dividers and stored in photo inserts with a magnet piece…I do file by shape (rectangle under R, circles under C, and also by item – flower under F). These binders are VERY heavy now and totally full – and this is only my Spellbinder dies! I have LOTS of Cheery Lynn Designs, as well as the companies you mentioned and they are in snap ware again A-Z, etc. Your way seems to be ideal, and you mention you have a catalog…can you please describe your catalog and how you index it…pretty please. WOW! Now that is a collection of dies, what a great way to store them. I definitely need some organization. Thanks for the chance. I’ve got my stamps organized but my dies are still an issue. Your ideas may be what I need. Thanks again Becca for all your amazing help to everybody in this world, no matter what it´s about, then we can always count on you to help us,if we have any questions about anything. WOW, that is fantastic, I’m so envious. The count is 436………. can’t see me winning anything in that collosal amount Becca! That is the tidiest office I have ever seen! I have been leaving comments in hopes that I am the lucky winner of this amazing prize package so I can get my dies corralled and more manageable but I don’t think I have thanked you yet for sharing this very detailed and helpful post. So, THANK YOU for sharing this information with us! I have done tons of research on how the best way to store dies is and after learning MANY ways to store them I have come to the conclusion that this way is the one that would best suit MY die storage needs. I know that everyone prefers a different system but after trying lots of ways and being frustrated with them all this way seems like it would suit my needs. The only thing holding me back is cost so winning this would enable me to give this storage solution a try sooner than later. I will be keeping my fingers crossed hoping to see my name later today as the incredibly blessed recipient of this prize package! If I don’t win then I will still be happy for whoever does win. Jealous but happy for them! Thank you for the chance to get started on organizing my rather large die collection! 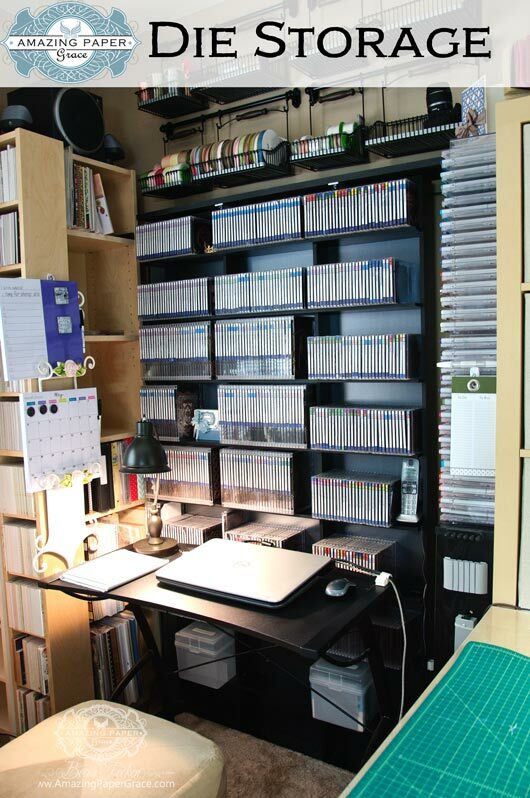 I’m probably too late for the give-away, but wanted to comment that I love your system… I wish my room looked like this! Any new and creative ideas about making my craft room more organized is greatly appreciated. Love your work. It gives me a lot of inspiration. You have got a lovely storage room where you keep all your dies in order. Been a single Mum it is hard too have everything. I’m only just reading this post and just habe to tell you that this is exactly how I store my dies only mine are in the black dvd slim cases that I get very cheaply from the discount store. I print out a lovely colourful sleeve showing me exactly what is in there. Inside I also cut down pieces of magnetic storage sheet and find that as long as it is long enough to sit all the dies on length ways, it doesn’t need to be the whole width to keep them in place. 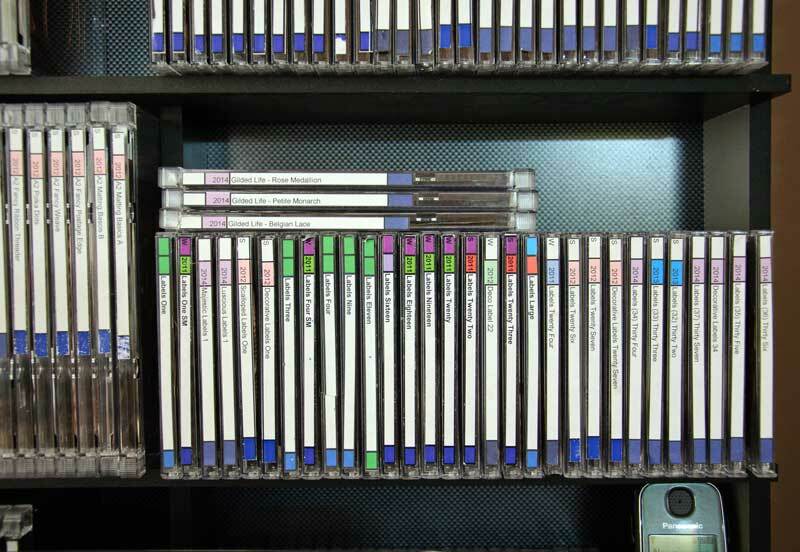 These are stored on a dvd shelf/rack turned so that tney are stored horizontally. I managed to set up so that the description fit right on the spine of the case too (that took some doing!). I then group them into nestabilities, shapeabilities, labels etc then the nesties split into squares, circles, ovals etc, and the shapeabilities into group I.e. Christmas, nature, Accessories. I haven’t got a fraction of what you have (not many people have lol), but I have had this system since the beginning when I bought my first die cutting machine back at Christmas 2009 – way before I began blogging and finding lots of wonderful alternative storage ideas. However, I think this system works brilliantly – it seems that great minds think alike!! Thanks for sharing your way of organising your dies!